In the quest for gorgeous curl definition, frizz can be your number one enemy. We know it can be impossible to predict how your curls will behave from one day to the next, but with this frizz free regimen you can minimize your frizz forecast. Use products that are gentle enough for daily or bi-daily cleansing for the hot summer months. Be sure to use the amount recommended for your hair length and type. Wash cleansers into your hair gently with the pads of your fingers and use a wide tooth comb to distribute the products throughout your hair. When applying conditioner, be sure to add a bit of extra water from your shower to add more slip, and leave your conditioner on for a few extra minutes while you shower. 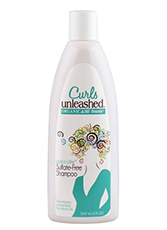 A good leave-in conditioner will help keep frizz down and lock in shine and moisture. Be sure to use ample amounts of leave in, as you may have to find what, and how much, works best for your hair in the hotter, more humid, summer months. 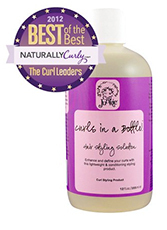 A good leave-in will help protect your curls, fight frizz and maintain bounce and shine. Some to try for the summer are JessiCurl, Curly Hair Solutions Curl Keeper, Oyin Handmade Go Tea Grooming Spray, As I Am, Curl Junkie, and Mixed Chicks. Follow up with a gel. The gel will also help to keep curl pattern as well as shine and bounce. Lastly, be sure to stay away from blowouts, straightener and even take a break from your diffuser. Hot air and tools will only add volume to the hair shaft, causing more frizz. Give your curly locks a summer “retreat” by allowing them to air dry as much as possible.